Companies emerging from the recent economic downturn must stay competitive, maintain cost reductions and support virtual workplaces for employees while improving communication between Marketing and Sales. Sound like a tall order? iLinc’s integration with Saleforce.com lets you address these challenges head-on with the power of two best-in-class applications seamlessly combined into one. 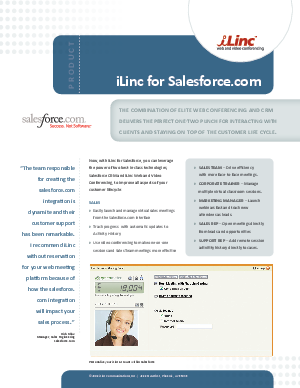 iLinc for Salesforce launches right in your Salesforce application. As a Force.com “App of the Week” winner, this integration not only allows you to hold compelling webinars and sales demos that are more cost-effective than in-person events, but it also helps you demonstrate the effectiveness of these events with reports on attendee behavior. Attendance data is tracked and automatically available in Salesforce.com. (No more manually entering webinar data into your CRM system). Understanding when prospects participate and knowing how long they stay will give your Sales team instant, crucial insights on prospect interest level. The results? An accelerated sales process that will help close business faster and the ability to measure the influence of webinars on the sales pipeline. If your organization already uses Salesforce, iLinc for Salesforce can help you leverage your investment immediately. Download our whitepaper now to learn more.